If you’re a tattoo artist just starting out, or maybe a tattoo artist on a budget, you might find yourself looking at a ​Getbetterlife tattoo machine​. At first, you might be a bit skeptical about buying such an inexpensive machine, but I am here to put your mind at ease. We got our hands on the Getbetterlife Danny Robinson tattoo machine set, and we couldn’t have loved it more. 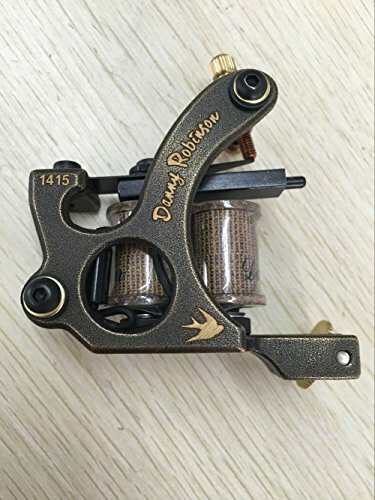 This Getbetterlife tattoo machine set is sponsored by Danny Robinson— a popular tattoo artist from England—and features two machines: both a liner and a shader. Both of the frames are made entirely of copper giving them a very heavy feel to them, if you love a heavy machine you will love this set. The machines raise the bar when it comes to the quality of an inexpensive tattoo machine. Not every tattoo artist can afford to spend $200-400 on a single machine, so it’s nice to see such high-quality machines come at such a great price. They both come in their own very sweet individual boxes, but this just an added nice perk. Another awesome perk is they both come with a lifetime warranty. The liner is absolutely the best part of this whole deal without a doubt. When we tested it out, we found it best ran sitting at 5 volts. Let me tell you, this machine hits hard, and didn’t bog down on us at all. The other great things about it are the lines sink in like nobody's business, and it has great throw. In all honesty, this liner would be great for anyone as an everyday use machine. I wish I could say the shader was as awesome as the liner was, but it’s just not quite there. That’s not to say this isn’t a good shader, but just that the liner was that good. We found to get the best out of this machine you had to run at 7 volts, but even then we wish it would hit a little harder. With a little adjusting, you can make this shader into a very serviceable machine, but it’s not going to wow you and take over the spot as your favorite shader. If you're a beginner, you might want to think about buying a complete tattoo starter kit. A lot of them are pretty shady, but there are some great ones that include everything you need to start ​practicing!